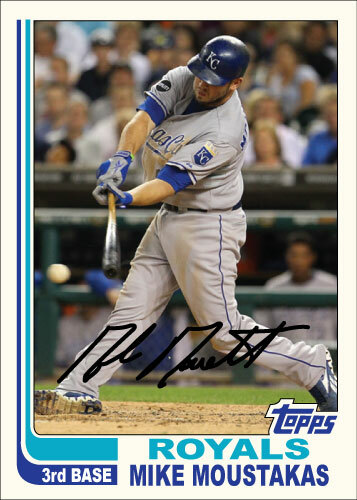 According to @PaddyKC on twitter; Mike Moustakas is batting .378 over his last 30 games, if that isn’t worthy of a custom card today I don’t know what is. Over the last few games he has re-discovered his power as well. On August 18th Moustakas was batting .195; On September 18th he is batting .252. Last night the Royals won their 7th straight game by beating the White Sox 10-3. Mike Moustakas went 3-4 with a home run, 2 RBI and 3 runs. This is the 3rd straight game that Moustakas has pounded out 3 hits and 2 RBI! Over his last four games he is 10-16 with 3 HR, 7 RBI and 6 runs scored. Its great to see Moustakas hitting well after struggling so much in the middle of the season. The power is good to see too but I was never worried about his power. Mike Moustakas has power, if he isn’t hitting home runs it doesn’t mean that power is gone. If he hits well the power numbers will come. I was concerned about his average hanging around the Mendoza line but I was never concerned about his one homer in his first about 275 at bats.